Since this is a kinetic sculpture, I figured that I wasn't the only one to take a video of this. I also thought that Image search might be a bit tricky. So, searching in Google Videos for [ flip animated sculpture airport ] leads quickly to an instantly recognizable video of "Cloud." In response, we created 'Cloud', a five meter long digital sculpture whose surface is covered with 4638 flip-dots that can be individually addressed by a computer to animate the entire skin of the sculpture. Clearly, having the search terms "airport" and "sculpture" in the query was important. How you described the kinetic aspect or the makeup of the discs (mirror, aluminum, flipping) all led to the same places. And finally, kudos to everyone who listened to the sound and figured out it was British Air. I'm impressed. I was there, and it wasn't clear that *I* understood what they were saying! Great sleuthing! If you're a regular reader of the Google Scholar blog (and if you use Scholar more than a few times a year, I highly recommend signing up for the email updates), you already know what I'm about to tell you. But if, like me, you use Scholar all the time, but neglected to signup for the emails.. then this post will help you out. Question: Where did the nice blue link to "Advanced Search" go? ADVANCED SEARCH MOVED! I had to poke around quite a while before thinking of checking out the Scholar blog looking for any updates. Sure enough, I found it--on the update of May 11, 2012.... 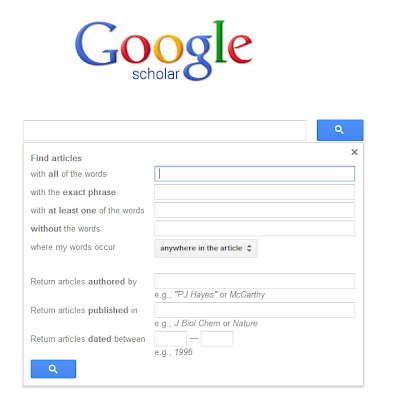 Note that Scholar's Advanced Search button has moved! And once I started reading, I realized that I'd missed several announcements. MY UPDATES: The most interesting one is the new presence of "My Updates" in the upper right. We analyze your articles (as identified in your Scholar profile), scan the entire web looking for new articles relevant to your research, and then show you the most relevant articles when you visit Scholar. Well, that's kind of nice! It's a bit like having a Google Alert set up for you... on EVERYTHING you're professionally interested in (that is, according to your Google Scholar profile). When I clicked on "My updates," Scholar gave me a bunch of citations to papers that I didn't know about... but really wish I did. All of these are papers written by other people who either cite my own work (such as all of my sensemaking articles--cool!) or refer to concepts and key phrases (such as gaze-tracking and aggregated search) that Google has pattern-matched for me. It's a little like an academic match-making service that digs deeply into your work to find other work that's compatible (or at least interesting) with your own. 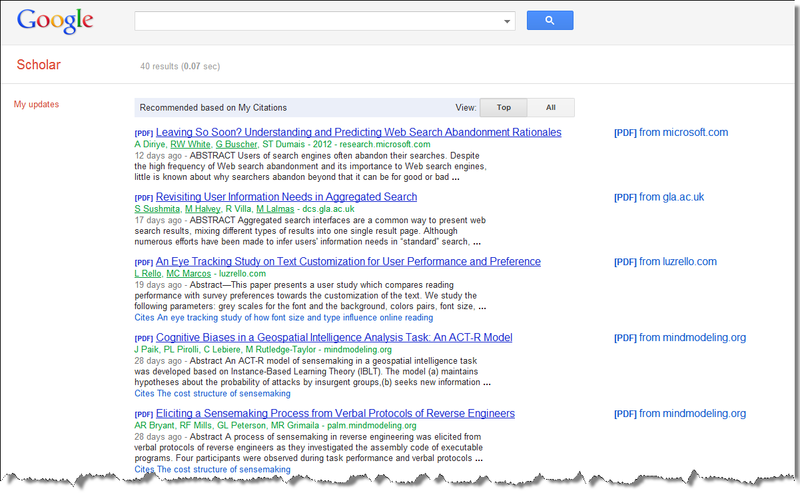 Okay--lesson learned: I just signed Google Scholar in my Google Reader. That way, when I check Reader, I'll see the updates there. 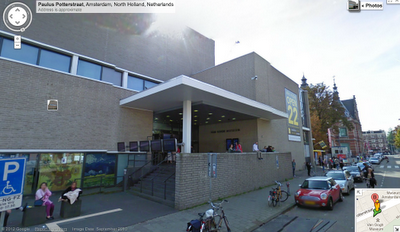 Quick answer: I'm in Amsterdam, standing in line for the Van Gogh Museum. I'm impressed at how well everyone did on this search challenge! Here's the way I'd solve this problem. I'm trying to figure out generally where the photo was taken. 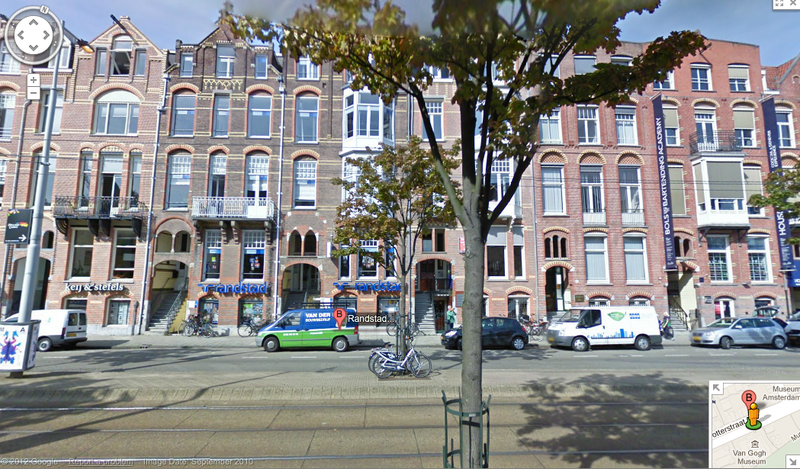 From this, it's pretty easy to figure out that I'm in Amsterdam. 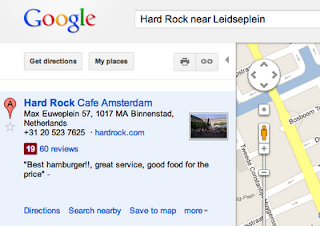 From that information I'd go to Google Maps, get to Amsterdam, and then look for the Hard Rock Cafe. 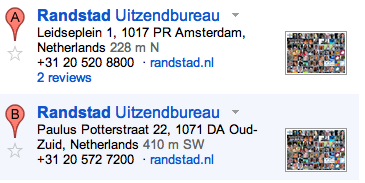 Then... using Search Nearby for [randstad] using another visual clue. 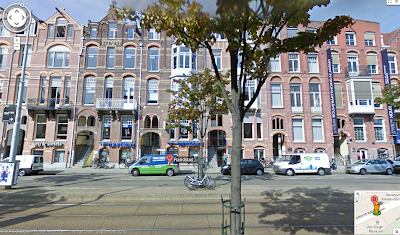 You can use StreetView to look all around in the different directions. That's not it. 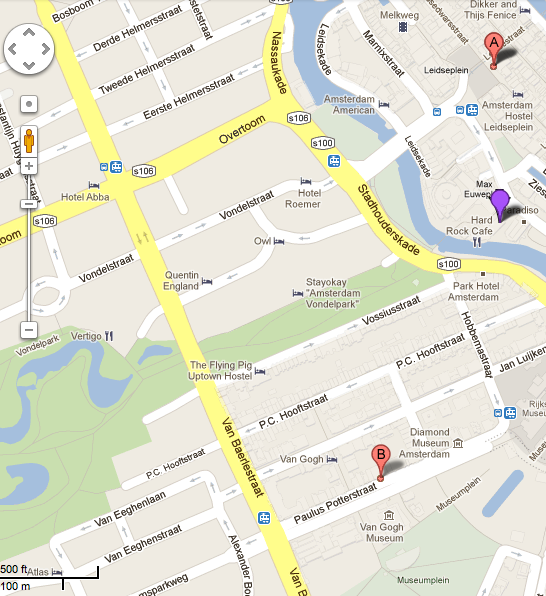 Let's check out the other location (B) with StreetView. Voila! This looks exactly like the photo I took. if you then pivot around and look behind you... this is what you see. Search Lessons: Sometimes search is really search! You might have to check out a number of different possibilites. In this case, we got lucky and only had to look at two places. Working from the text available in the image ("Hard Rock...") we were able to zero in on the city name, then using "Search Nearby" with another clue, we could get close to the target. So... knowing about "Search Nearby" is a handy tool to have in your personal search toolbox. Nothing quite like it anywhere nearby! 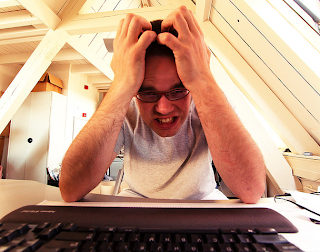 Wednesday Search Challenge (8/22/12): What am I doing? Today a simple challenge to state, but probably fairly difficult to do. What was I doing when I took this picture? What’s going on with bluebirds, Henry IV, and their possible population demise? When I heard the original comment on the radio, I was able to track it down by finding the program web site (in this case, “To the Best of Our Knowledge” at TTBook.org) and find the program (search for [ Shakespeare starling ] and you find it in one click), and then listen to the program again. 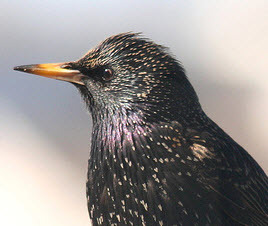 In the radio show (and in the book “How Shakespeare ChangedEverything”) Stephen Marche writes that starlings were mentioned in one line of Henry IV, part 2, which then motivated Bronx pharmacist Eugene Schieffelin to introduce 60 pairs of starlings into Central Park in the winter of 1890. That succeeded so well that there are now, 120 years later (2012), more than 200 million starlings in North America, where they cause huge damage to fruit crops, buildings and... incidentally… other birds. That’s such an astonishing claim that I had to see if it was true. A little background research on Eugene Schieffelin reveals a real character. He was a member of the AmericanAcclimatization Society as the group that released starlings into Central Park as a kind of art project in 1890 to make Central Park a little more cultured, and that meant Shakespearean. As it turned out, most of the birds they introduced from Shakespeare’s mentions turned out to be harmless or low reproducers. The exceptions—starlings and English sparrows—continue to plague North America to this day. ANS: The starling was mentioned in "Henry IV, Part 1" for its remarkable mimicry abilities, where it was to be used as a constant reminder of a wrong my repeating the name of the wrongdoer. They were introduced to New York in 1890 and propogated wildly across North America. But it turns out that starlings bully several native species, often evicting bluebirds and woodpeckers. ANS: Eugene Schieffelin, a pharmacist in the Bronx, New York City. “…a study in 2003 found few actual effects on populations of 27 native species. Only sapsuckers showed declines because of starlings, and other species appeared to be holding their own against the invaders.” So when it comes to songbird decline, as Shakespeare almost said, maybe the fault is not in our starlings but in ourselves." So it’s not quite an open-and-shut case, but the preponderance of evidence does seem to be that starlings stress bluebirds (and sapsuckers). That’s great, muscular writing. While it would be rejected by any decent scientific journal, you can’t help but feel an appreciation for the starlings, bullies though they may be. "santimanitay" is the name of a song AND a common Trinidadian phrase ("sans humanite"). and... I was at Yoshi's jazz club in San Francisco, listening to Etienne Charles, the trumpeter from Trinidad, who was performing with his group. Now... how can someone figure out all of that? But the truth is that I heard something a bit more confusing that than. I actually heard "play sandymanity..." When I did this search originally, I found out that it was actually "santimanitay," and so I cut out the first step, which was actually the hardest part. (This is a bit like the problem with mondegreens. See my earlier post on mondegreens.) How DO you go from something vaguely heard to actual term in use? Keep guessing: In this case, I just had to keep guessing variations on the spelling. Eventually (after about 5 minutes), I figured out that the "santimanite" variant was the right hit (a Trinidaidan song). If that hadn't worked out, I was going to start looking through discographies of the trumpeter and see if I could recognize anything similar. Luckily, I found it after just a few tries, mostly by changing the parts of the word that seemed most likely to be heard as a variant. That is, "sandy..." could be "sanbe..." or "santee..." or "santi..." Likewise, "..manite" could be heard as "..mandite" or "..manditey" or "..manitay." Interestingly, "santimanite" (or "santimanitay") is derived from "san humanite" meaning (literally) "without humanity," but colloquially, "without mercy." Once I knew that "santimanite" is the name of a traditional Trinidadian tune, I knew enough to search for "lime" as a word with a Trinidadian twist. was enough to give several definitions and typical uses. Now we're getting somewhere. Doing the same trick with "extempo"
shows us that "extempo" is a style of improvisational singing (often done to the tune of "Santimanitay") where one singer will make up the lyrics as they go along, somewhat in the style of freestyle rap. In competition, topics are drawn from a hat, and the singers go head-to-head in making up verses. You'd think there'd be some extempo on YouTube, and sure enough, there's a bunch. Here's a nice example from YouTube showing a couple of singers (Lingo and Black Sage) doing extempo from Carnival, 2007. Search Lessons: First, when searching for unfamiliar terms, sometimes you can figure them out just by fooling around a bit. Don't get too hung up getting everything just right, often the Google spellchecker will help out by suggesting alternatives. (This is ultimately what worked for me.) Check the results and iterate. Second, when searching for word meanings, it's often useful to include a "context term" to set the stage. As you know, "lime" has a LOT of meanings. But in Trinidadian use, there's only one use as a verb. Including the word Trinidad simplified that search tremendously. Finally, as most readers figured out, it's a small step from [ Trinidadian trumpter ] to discover that it's Etienne Charles. A quick search for his tour schedule, and you'll find he was at Yoshi's on Tuesday night, August 7th, 2012. Wednesday Search Challenge (8/8/12): Who said that? Here’s a kind of search problem that people have fairly often. And I’m pretty sure I got the words reasonably accurately, but I have no idea what’s going on! Tell us HOW you figured this one out and about how long you took. Apparently this question was a bit harder than most. Of the people who sent in their times, the average was 16.9 minutes. Excellent dedication on the part of the Search Challenge solvers! The sport under discussion here is Chilean rodeo, which I found by searching for the two terms that I didn’t recognize at the start—huasa and collera. 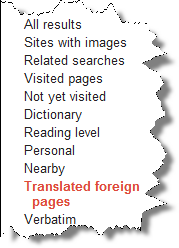 From these terms you can quickly get to Wikipedia, which defines them as Spanish language terms used in Chilean rodeo. 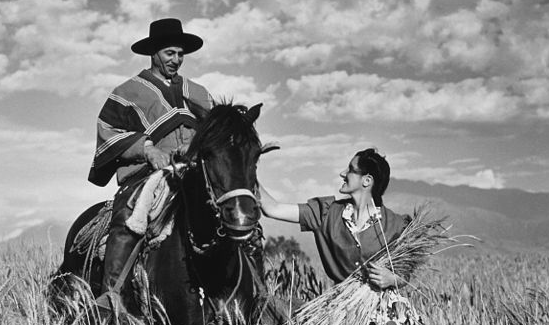 I also did a search for [ Michelle Recart ] and found that she was the first woman to be a huasa in the sport of Chilean rodeo. Interesting! That's a good start. Has a “jump to” link to “National champions of Chile” which turns out to be a list of the rodeo stars that have done well over time. Reading a bit shows that the two greatest champions were Ramón Cardemil and Juan Carlos Loaiza. I did two quick searches, one for [Ramón Cardemil statue] and another for [ Juan Carlos Loaiza statue ] (and just to be sure, I ALSO did these searches using “Translated foreign pages” (a tool on the left-hand side under “Show search tools"). After reading a few pages, it was clear that Cardemil has a statue in Curicó, Chile, called "La Atajada”—now, who’s the sculptor? Again, using “Translated foreign pages” as the search tool, and a query like [ la atajada sculptor ] it’s not hard to find that it was made by Graciela Albridi Cifuentes. Once more, a search for [ Graciela Albridi Cifuentes born ] (again, using "Translated") leads to her personal web site saying she was born in Syria to Chilean parents. So, Chilean rodeo (which is the second most popular sport in Chile) has only two mega-winners since the sport began record-keeping in 49. 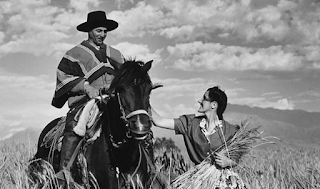 Ramón Cardemil Moraga and Juan Carlos Loaiza MacLeod both have 7 wins according to the English-language Wikipedia article on Chilean Rodeo winners. In the comments, FCDukie points out: "Apparently Ramon Cardemil does not actually have the most championships in the sport, that title goes to Juan Carlos Loaiza, with 8 championships to Ramon's 7." And FCDukie is correct… thanks for the correction! Searching for [Juan Carlos Loaiza ] using “Translated” leads you to the Spanish language version of the Wikipedia entry for Loaiza, which documents his 8th win in 2012. Wednesday search challenge (8/1/12): Where was the sculptor born? Her appearance was notable because the sport has a long-standing tradition of being exclusively male. All of the sport’s heros are men, and until Michelle Recart started competing, all of the competitors were male. And yet, interestingly enough, the only statue raised to this sport’s greatest hero, winner of most championships since the sport began, was sculpted by a woman. Question for today: Where was she (the woman who made the sculpture) born? Extra credit: Where is this sculpture located (what city)? And when was this sculpture unveiled? As usual, please let us know how long you took to answer the question, and what search/research methods you used to find it!